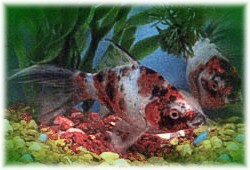 The shubunkin is a most popular type of gold fish that was first bred last century approximately around 1900. It originated in Japan but around 1930 it was "adopted" by England. Two cities in particular, namely Bristol and London, were where they were fascinated with this aquarium fish and they named two different types of these beautiful fish after their cities. The Bristol type has more tail plumage where the London type looks more like the comet goldfish. There is actually no mystery about this as it was a cross between the calico fantail and the comet. That’s why they are similarly shaped. As you can see by the picture below the shubunkin is a speckled goldfish and the colors can often include orange, reddish, white, black and a light blue. The fins are quite attractive on these fish. Indeed most grow to an average size of about 15 centimeters (6 inches) but they are very hardy fish that are suited to most beginner aquariums and even outside ponds. They are also very social fish but beware! They are faster swimmers than other slower goldfish that you might have in the aquarium or pond like the bubble-eyes. They’ll gobble all the food up before the others get the chance to have a decent meal. Also don’t over-crowd the tank or pond and the others will have a better chance of getting more food. Sidebar - Did You Know? Gold fish don’t have eyelids but they do sleep. That’s why you need to turn off the room lights at night so they’ll have a better sleep pattern. Talking about food they are like many other types of goldfish in that they are omnivorous. They’ll eat fresh, frozen of flake food without much fuss. They’ll breed readily when they are mature and if you have the right conditions you should end up with lots of fry. They are also egg-layers so you’ll need some vegetation which makes it easier for them to spawn properly. Ph: Ranges between 6.0 and 8.0. Water Change: Once every two weeks at least, 30% at a time. Filtration: Good Filtration system & plenty of swimming room, clean gravel. I hope you enjoyed this page!